Fox News dropped its lawsuit against Al Franken on Monday, three days after a federal judge refused to block the liberal humorist from using the Fox slogan "Fair and Balanced" on the cover of his book. The lawsuit had sought unspecified damages from Franken and Penguin Group, publisher of "Lies and the Lying Liars Who Tell Them: A Fair and Balanced Look at the Right." "It's time to return Al Franken to the obscurity that he's normally accustomed to," Fox News spokeswoman Irena Steffen said. On Friday, U.S. District Judge Denny Chin denied Fox's request for an injunction against the book cover. Fox contended that some people might be tricked into thinking the book was a Fox product because the cover includes the words "Fair and Balanced" and a picture of Bill O'Reilly, the network's top anchor. But the judge said Fox's case was "wholly without merit," and the trademark "Fair and Balanced," registered by Fox in 1998, was weak. He also said the network was "trying to undermine the First Amendment." 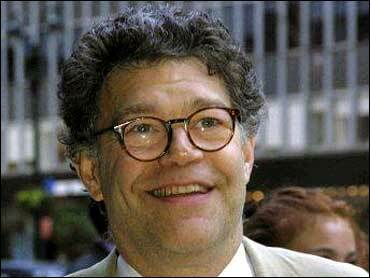 Franken joked that he was "disappointed" the lawsuit had been withdrawn. "I was hoping they'd keep it going for a few more news cycles," he said. Floyd Abrams, who represented Franken and Penguin in the case, said the withdrawal of the suit was "welcome, if overdue." "Fox's lack of grace in ending its suit is of the same nature as its name-calling and silly efforts to deal with criticism of it in the first place," Abrams said. The lawsuit itself, filed earlier this month, described Franken as a "C-level political commentator" who "appears to be shrill and unstable." Publicity surrounding the case helped boost Franken's book to the top of the Amazon.com best-seller list. Penguin rushed the book into stores early and ordered additional copies printed after being sued.